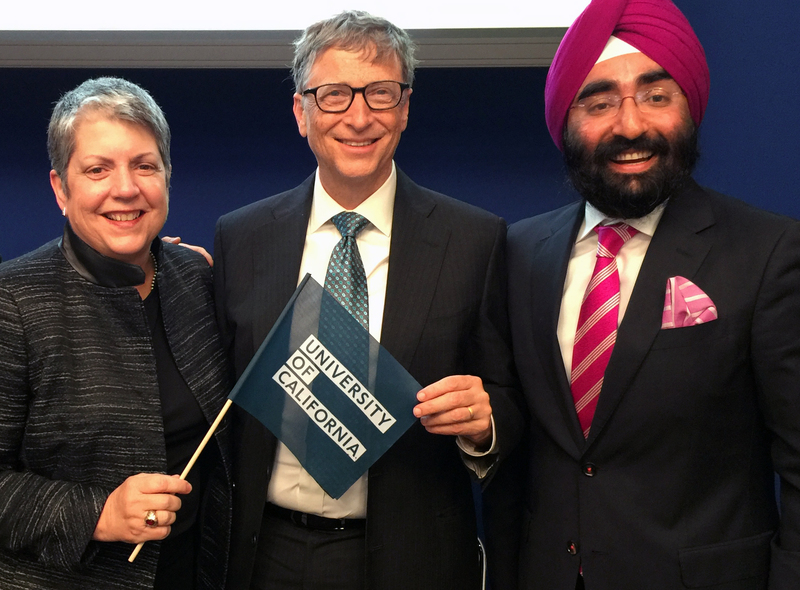 UC President Janet Napolitano, Bill Gates and UC Chief Investment Officer Jagdeep Singh Bachher celebrate the announcement of the Breakthrough Energy Coalition in Paris. The University of California announced today (Nov. 29) that it has joined the Breakthrough Energy Coalition, an influential group of investors led by Bill Gates that is committed to investing in technology that can help solve the urgent energy and climate challenges facing the planet. UC and its Office of the Chief Investment Officer, which manages the university’s endowment and pension funds, is the sole institutional investor among the 28 coalition members from 10 countries. The coalition is a counterpart to Mission Innovation, an initiative of 19 countries committed to dramatically increasing research and development funding for early-stage clean energy innovation over the next five years. Both initiatives were announced today at the COP21 in Paris, the United Nations Climate Change Conference. Collaborate with public institutions in other Mission Innovation countries to share approaches to developing research for private sector investment. In November 2013, Napolitano announced UC’s Carbon Neutrality Initiative, which commits the university to becoming carbon neutral by 2025, which would make UC the first major university in the United States to reach this achievement. The ambitious target builds on UC’s pioneering work on climate research – as evidenced by its report on 10 scalable solutions announced last month – and furthers its leadership on sustainable business practices. UC is improving its energy efficiency, developing new sources of renewable energy and enacting a range of related strategies to cut carbon emissions. UC’s Office of the Chief Investment Officer has committed $1 billion of its investment capital for early-stage and scale-up investments in clean energy innovation over the next five years, as well as an additional $250 million to fund innovative, early-stage ideas emerging from the UC ecosystem. It also has created an aligned intermediary, which will help large-scale, long-term investors channel significant amounts of institutional capital into resource innovation investments – including energy, waste and water – across the planet. The University of California, home to 61 Nobel laureates, 86 winners of the MacArthur Foundation’s “genius” grants and 67 recipients of the Medal of Science, is widely considered to be the world’s premier public research university system.